EVERY year, some of the distinguished chefs are selected to dish out menus specially for United Overseas Bank cardmembers at exclusive rates. One of the participating restaurants is newly launched FiveSen5es that serves authentic Cantonese cuisine and is famous for its pork dishes and abalone dumpling — their best selling dimsum. Executive Chinese chef Ng Kok Wai said both these signatures have been incorporated in the set dinner menu. The dinner kicks off with a light but flavourful broth made using the Hunan ham stock which is of high concentration with their signature abalone dumpling and Hong Kong choy sum. This is followed by a choice of either a pork or beef dish for the next course. 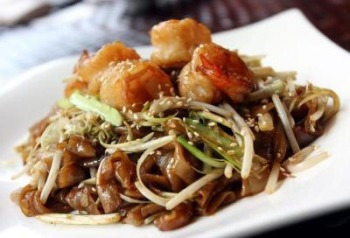 Lip-smacking good: Hong Kong Wok-Fried Soft Noodles, Shrimp and Silver Bean Sprouts. 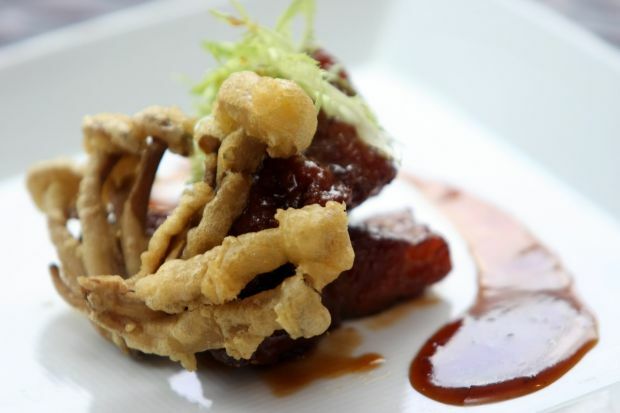 “As for the pork dish, we only use superior pork belly ribs with equal distribution of fat and meat. It is marinated for four hours with our secret recipe and is deep fried. However, the extra flavour comes from the combination of sauce that the meat is coated with. This dish is served with fried shimeji mushrooms. “Quality is very important to us and only premium Australian beef tenderloin is used in the cooking. The meat is sliced and rolled with enoki mushroom, pan seared, and cooked with honey bean and pepper sauce,” said Ng. The last dish was the Hong Kong Wok-Fried Soft Noodles with Shrimp and Silver Bean Sprouts. The shrimps are marinated with seasoning for four hours and fried until it is slightly crispy on the outside and juicy on the inside. Yellow chive and spring onion are also added to make it more fragrant. The UOB Chef’s Creation promotion set is available for lunch and dinner, priced atRM88++ and RM168++ per couple, respectively. The promotion is valid from now to Dec 30.